Length: 4 1/8” Weight: 1.1 oz. Length: 2 1/8” Weight: .4 oz. Length: 2 1/8” Weight: .6 oz. General Notes: Shown in a CCBCo catalog after WW II, but not available. This is a rare bait in any color, especially in super condition. A heavy duty lure aimed at the Muskie & saltwater market. Has the usual metal head plate, heavy hooks, dyed horsehair tail. The CCBCo catalog stated “Trolls beautifully & still is not too large to cast with an ordinary pole”. Description of Pictured Lure: #5700, Pikie Scale: This design wasn't fabricated with through-wire hardware as seen on other Muskie size baits. It displays "Dinger" gold stenciled on its back. Many of these large size baits were damaged by the teeth of bigger fish. Therefore, very few superior condition baits are available to the collecting fraternity. General Notes: An impressive glass eye bait based on a best selling design. #24 Redwing Blackbird & #25 White Scale are listed colors, but are extremely rare. This series produced in thirteen colors, which is unusual for most larger baits. Priced at $1.10 in the 1942 catalog. Pictured, but not available in late 1946 to 1947 as the company was gearing up after WW II & wanted to concentrate on their best selling baits. #5807, Mullet. This color was available on this lure from 1948-1954. Mullet comes in many hues from a silvery color to a beautiful deep blue. This example has deep aqua on its back blending to a paler silver/blue on the sides. A surface bait aimed at the “lunker” market. General Notes: The glass eyed version offered in fifteen catalog colors. A few colors were available for a limited time: #03 Silver Shiner 1955-1956, #33 Black Scale 1955-1958, #38 Pearl 1955-1958. Not generally as common as the #3200 series Plunker. 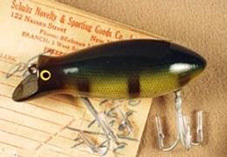 Painted eye wood baits were introduced in 1961. No Midget Plunkers made from 1965-1971. No plastic baits were produced. #5938, Pearl. A very fragile color that usually exhibits age lines, heavier cracks or paint bleed-through. No back marking on this one. A limited production color. Has glass eyes. Different overtones of pink & lavender were created by airbrushing these details. They differ from bait to bait. General Notes: Also offered with the option of a Deep Diver lip from 1950-1953. Available in the same unusual color combinations as the #3800 Beetle series. Generally scarcer than the big Beetles because these miniature Beetles were produced for eight years less. #6054, Gold Beetle. A scarcer color on this & the #3800 Beetle size. Has a marked lip, bead eyes, two small treble hooks, & a single pearl spinner. A tremendous amount of hand finishing on this bait. A dipped body, airbrushed wings & spots, plus hand painted borders. This one has “Beetle” gold imprinted on its belly. Length: 2 1/8” Weight: .5 oz. Length: 2 1/2” Weight: .6 oz. Length: 1 3/4” Weight: .5 oz. General Notes: Produced for only ten years, so generally tougher than #5600 Dinger series. One belly hook instead of two on the regular Dinger. Has the model name on the metal head plate. A steel leader. The catalog list the length at 3 1/2” which includes the horsehair tail. The wood body is 2 1/8". A 1939 catalog, evidently sent out late in the year, had an insert added which listed this bait as one of the new baits for 1940. Is it a 1939 offering or not available until 1940? Take your choice. #6113, Black. Marked lip, steel leader, plated head plate, glass eyes. The horsehair tail is color coordinated with the paint pattern. General Notes: A very unusual lure. Combines the features of three baits: A modified Plunker face except it’s angled so the right edge is closer to the right side glass eye than the left. It has two hooks & a lead weight on the right side so it acts like an Injured Minnow. Finally, a flat hair tail similar to the Dinger. The two most expensive colors are #24 Redwing Blackbird or #25 White Scale. Creek Chub wrote “Destined to be one of the greatest surface lures ever produced”. Description of Pictured Lure: #6218, Silver Flash. Has a red mouth & usual olive green shading around eyes & front section of top, blending into a silver chain pattern down its back. Silver glitter on the sides & a white belly. A red & white horsehair tail compliments the paint pattern. General Notes: A style similar to a Plunker bait, but with a different angled mouth & a clear lacquered aluminum scoop-shaped lip added on the lower front edge. Three screws hold the lip in place. This feature allowed the bait to be fished on the surface or underwater depending on how the angler worked the rod & reel. Some early examples had the model name gold stenciled on their back. The company instructed the angler to tie the line directly to the screw eye for best balance. #6325, White Scale. This & the #24 Redwing Blackbird are the two most desirable colors within this series. This example is a beautiful combination of black, red, white & goldenrod yellow. Has the usual two treble hooks. General Notes: A favorite with Creek Chub collectors even though it has painted eyes. Customers had the option of a Deep Diver lip from 1950-1954. Several unique colors were developed for this lure: #26 Red & White w/ Wings, #27 Spotted, #28 Gray. A lead weight is in the belly of Tiny Tim baits. 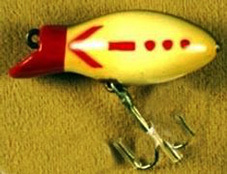 This lure reappeared in 1970 with a new lip & three fluorescent colors which were added to the regular line. The series was renumbered #6100. #6424, Redwing Blackbird. Usual company marked old style lip, painted eyes, two treble hooks. One of the many scarce Tiny Tim colors. Length: 2 3/8” Weight: .3 oz. Length: 3 3/4” Weight: .6 oz. Length: 6 1/4” Weight: 3.2 oz. General Notes: Developed during WW II because of a metal shortage. The “lip” is actually an extension of the wooden body. The two most exciting colors are the #02 Red & White Victory & the #29 Red & Yellow Victory. The “V” & the Morse code for this letter are airbrushed on the side (the code is actually backwards). This series was illustrated in the catalog after the war, but marked “not available”. The 1942 catalog states “will create havoc among the fish population“. No painted eyes on the Victory colors. Description of Pictured Lure: #6502 Victory. This lure was made in Red & White with the Victory design. The “V” sign was brought into prominence during this era when Prime Minister Churchill held up his fingers forming this letter to signify victory over the Axis powers. It became a sign & a symbol of the times. The non-Victory colors have painted eyes. General Notes: The older examples in this pattern display a "V" on the sides for Victory and a Morse Code which denotes "V". After the war, the Morse code and "V". side motifs were deleted. This wooden bait is a shallow diver. No painted eyes on the two Victory colors. #6629, Yellow & Red Victory. Most consider this pattern the most desirable color in this series. Usual single line tie, two treble hooks. A great wartime bait with a patriotic name & design. General Notes: Overall, this size is the scarcest of the three Bomber series. Produced in six colors only during WW II. As usual, the #02 Red & White Victory, #29 Yellow & Red Victory are the two most coveted colors. A shortage of strategic metals & imported glass eyes created the need for this bait. Most had painted eyes. Lips were actually wooden extensions of the body. Description of Pictured Lure: #6701, Perch. 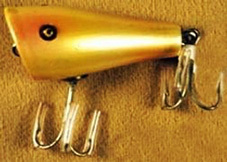 A floating, shallow diving lure. The usual single line tie & two treble hooks. This color had painted eyes. Without a doubt, a war time bait borne out of necessity. General Notes: Strictly made for “keeper” fish, either freshwater or saltwater. Has an inmproved lip which is usually attached to a strong swivel. Through-wire construction & giant treble hooks. A behemoth! There are several scarce colors, primarily: #19 Frog, #33 Black Scale, #35 Purple Eel, and #37 Yellow Flash (especially with glass eyes). Tack eye first available in 1961. Not made in plastic. Description of Pictured Lure: #6808, Rainbow. This color offered from 1950-1954 on this series. 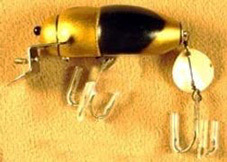 “Pikie” gold imprinted on its back, two big screws hold the lip in place, glass eyes, three heavy duty treble hooks. Length: 6” Weight: 3 oz. Length: 2 3/4” Weight: .7 oz. Length: 5” or 4 1/2” Weight:1.2 oz. General Notes: The straight version of the #6800 series, & generally scarcer. Has the improved lip, usually with a strong swivel. Glass eyes offered until 1960, then tack eyes. A belly weight between the hooks, through-wire rigging, treble hooks for big fish. Not made in plastic. A scarce color is #37 Yellow Flash, made from 1953-1958 in this series. #6907, Mullet. A beautiful deep sea blue. “Pikie” gold impressed on its back. Big screws hold the lip in place. This bait can handle about any size freshwater fish & many saltwater species. General Notes: Essentially a #300 Crawdad with a different flat tail. However, only the #01 Perch & the #18 Silver Flash are shared by both baits. #02 Albino is a white Crawdad with a blush of red at the mouth whereas the #02 color in the #7000 series is the traditional white body with full dipped red head. A scarce modern series produced for a limited time. They have bead eyes & rubber legs. General Notes: This bait was known by many names: Snook Plunker, Spinning Popper, Salt Spinning Popper, & Salt Popper. The 1953 catalog offers a bucktail as an option for 35c extra. Soon, it was a standard feature. The earlier baits were listed at 5”, while later examples are shown at 4 1/2”. Originally made with glass eyes. By the early 1960’s, painted eyes were the norm. #7118, Silver Flash. The shorter version with a white bucktail, glass eyes, & a belly weight. A top water lure targeted for saltwater fishing. General Notes: The smallest of the three Surfster series. Has an unusual cupped, angled lip. Most Surfsters had a long flat area on their head & back. Produced with glass eyes until 1960, then tack eyes or as a plastic bait. This series had a fat “Pregnant” body until 1964 when it was available with this body or a slimmer body based on a #700 Pikie. All the Surfster series were available in colors associated with fresh water & those colors normally used in salt water. #7234 Surfster, Blue Flash. Has glass eyes & the fatter “pregnant” body. Red accent around the eyes. “Creek Chub Surfster” gold imprinted on its back. Length: 7 1/8” Weight: 3.5 oz. Weight: Approx. 3 3/4 oz. General Notes: The medium sized Surfster has a larger scooped lip than the #7200 series. A “pregnant” body, glass eyes, and through–wire rigging. It later appeared on a 1964 price list...probably leftover stock from 1958. A big, serious top water bait. #34 Blue Flash has red shading around the eyes & #35 Purple Eel has yellow. #7337, Yellow Flash. A saltwater color considered scarce on most Creek Chub baits. Has the large Surfster lip, glass eyes, heavy rigging, & “Creek Chub Surfster’ gold imprinted on its back. #7435, Purple Eel. This color produced from 1953-1958. Has yellow shading around the glass eyes, two big screws holding the lip, & huge treble hooks. “Creek Chub Surfster” gold imprinted on its back. One of the largest baits in the classic original series, although later outdone by the Giant Pikie series. General Notes: A huge wooden bait with painted eyes. The largest Plunker style bait by far. The tail is internally weighted for casting into the wind. Made in five colors. Soon discontinued due to a shortage of White Cedar. Its sheer weight & mass often are factors in causing damage even while in a protected box. Shuffling & temperature swings can cause pointers & severe age lines even on “unfished” baits. This lure came in a huge red, white & green box without any fish graphics. #7535, Purple Eel. Considered one of the toughest colors in this series. Through-wire construction & weighted, but considered a top water bait. “Creek Chub Popper” gold imprinted on its back. General Notes: The largest Darter. Offered as a surf casting bait with a weighted body, strong hooks, & through-wire rigging. Made in six colors. Another short-lived salt water bait, deleted from the company line due to a shortage of good wood. Rarely offered in virtually perfect condition in any color. Description of Pictured Lure: #7602, Red & White. Saltwater exposure was a factor in diminishing the condition of most of these lures plus the sheer bulk seemed to attract its share ofbumps and bruises. Add a short production schedule and you have a hard-to-find lure. Weight: 1.8 oz. or later 2 oz. Length: 3” Weight: .4 oz. Length: 2 1/2” Weight: .2 oz. General Notes: A scaled down version of the #7600 series. It appears in the 1955 catalog with a line tie in the mouth & weighs 1.8 oz. Later, the line tie was on top of the head. Evidently this improvement held better & gave the bait more action. Offered with painted eyes, through-wire construction. The tail is loaded for casting into stiff breezes. #7734, Blue Flash. All wood, painted eyes, loaded tail, medium hooks. “Creek Chub Spin-Darter” gold imprinted on the flat-top head. This is a later version with the line tie on top of its head. easy-to-remember number just as they had done earlier on the successful #2000 series Darter. Produced in wood with painted eyes & two treble hooks. Although offered until 1978, it wasn’t made in plastic. A winning bait made by CCBCO for over 40 years. Description of Pictured Lure: #8031, Rainbow Fire. Usual painted eyes, two small treble hooks. “Darter” gold imprinted on its back. This color offered from 1950-1954. Has the yellow “Gantron” paint hook tag. General Notes: Not introduced until nine years after the #8000 rounded body lure. This #8000-CB series easily distinguished from the regular Midget Darter by the CB's semi-flat belly. Most CB's have three treble hooks. However, there is a later variation that employs two trebles. All have painted eyes. No "Darter" back markings on this series. Some of the late examples may include a gold foil label. A scarce color is #38 Pearl. It was offered from 1955-1958. This series also made in plastic from 1961-1973. #8014-CB, Yellow Spotted. Line tie on nose, three trebles, no model name on its back, produced in wood. #14 Yellow Spotted was used on eleven different series. General Notes: Part of the family of new spinning baits introduced in 1951. Spinning reels were sweeping the nation after WW II. A smaller, lighter bait could be fished with them much easier than a bait casting reel. Produced in eight colors through 1960. Later colors also offered. Plastic replaced wood in 1964. The slip-on plastic top box was introduced for these spinning baits in 1951 or 1952. #9014, Yellow Spotted. Two tiny treble hooks are attached to the body by screw eyes (no cup hardware). “Darter” gold imprinted on its back. The spots & mouth blush are expertly airbrushed. Length: 2” Weight: .2 oz. Length: 2 1/4” Weight: 1/4 oz. Length: 2 1/2” Weight: .3 oz. General Notes: A totally new concept introduced in mid-1954. The wooden body is mounted on a modified “Z” shaped metal platform. All spinning baits have painted eyes. A larger version is the #500 Spoontail which is part of the series with replacement numbers & not part of this study. #9101, Perch. “Creek Chub” on the lip, “Spoon-Tail” gold imprinted on the lure’s back, painted eyes. This series made in only four colors. General Notes: Another size in the Plunker family. Has painted eyes & two small treble hooks. Made in plastic only starting in 1964. A small box catalog notes “...sure to get the whoppers“. A much smaller profile bait than #5900 series Midget Plunker. A #9200 Ultra Light series in plastic is a variant. It was introduced in 1961. #9202, Red Head & White. Usual painted eyes. Hardware added for the line tie & tail treble but not the belly hook. Made in seven colors through 1960. 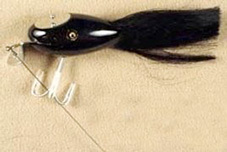 General Notes: Part of “The New Creek Chub Chubbies”, a group of spinning baits introduced by CCBCo in 1951. Many of these spinning lures were based on larger CCBCo bait designs. The Spinning Pikie had two trebles & painted eyes. Although not an expensive lure, they can be difficult to locate in new-in-the-box condition. Replaced by plastic Spinning Pikies in 1964. Also, made in an Ultra Light version in plastic. #9333, Black Scale. Usually, a tough color on most series. However, one of the easier colors in this series. General Notes: A smaller version of the very successful Jointed Pikies made in many sizes. Has painted eyes. There aren't any hook cups. Introduced at $1.25, housed in a new plastic slip-on top box which allowed the buyer a quick view of the bait – a great selling tool. The catalog touts this bait as “a fast, deadly wiggler”. Plastic only from 1964-1978. A plastic Ultra Light version was even smaller than this bait! Description of Pictured Lure: #9433, Black Scale. Marked lip, painted eyes, “Pikie” gold imprinted on top. Two tiny trebles. Issued in this color 1951-1956, then reissued from 1960-1978. Length: 2 1/4” Weight: .2 oz. Length: 2 1/8” Weight: .25 oz. General Notes: A miniature version of the best seller #1500 series “Crip” minnow. Has painted eyes, smaller dual spinners, two trebles. Plastic replaced wood in 1964. An Ultra Light plastic also first offered in 1960's. A SILVER color was introduced on this bait in 1957. These spinning lures were first offered in 1951, to accommodate the rapidly growing interest in spinning reels, which better handled light weight baits than did the bait casting reels. Description of Pictured Lure: #9519, Frog. Painted eyes, two tiny treble hooks & spinners, wooden body. “Injured Min-now“ gold imprinted on the side. A sur-face lure imitating a wounded bait fish. General Notes: A totally new design. Its name was surely derived from the long unmarked lip which allowed this bait to dive deep. A split ring line tie is attached to the lip. No metal cups for the two tiny trebles. Usual painted eyes for spinning baits. Made in five colors including #36 Black Sucker (different than Black Sucker used on #3900 Sucker series). #9636, Black Sucker. Standard deep diving lip, painted eyes, airbrushed blush on both sides. “Deepster” gold imprinted on the belly of this flat bottom bait. This color is the most desirable pattern within this series.